brand levitra price list Note 2: Please allow me to express my deepest gratitude to the Marxists Internet Archive website, http://www.marxists.org, and Wikipedia https://en.wikipedia.org/, for much of the material I am using in today’s Diary. Although in the public domain owing to its age, I would not have been able to gather this material had it not been for these websites and those who operate them. Therefore, I express my thanks for their assistance. where to how get generic levitra best price This classic portrayal of the Heroes of Haymarket Square in Chicago is the work of British illustrator http://citiva.com/?search=best-price-levitra-pills-professional Walter Crane (1845 – 1915). It is not quite as well known today, a century after his death, that Mr. Crane was a Socialist; that he employed his not insignificant talents in the graphical arts in the service to the Socialist and Labor movements in Britain and America during his time; and that even today his graphics still strike a serious chord with those of us who believe that source all wealth is created by Labor, and Labor is entitled to everything it creates. Epidemics of cholera as well as other serious diseases, including neoliberalism, can take a toll on solidarity. “Trade” deals, and the conduct used in pushing them through to adoption, can be purposely choleric in order to accentuate a breakdown in solidarity. A carefully-orchestrated disinformation and intimidation campaign can provide a loud and pushy disincentive to obtaining and sharing knowledge and growing into a healthier society. The Gipper is credited with the famous saying “trust, but verify.” However, it is actually an old Russian proverb. The phrase came in handy when scrutinizing the actions of the potentially dastardly Russian Mikhail S. Gorbachev. With matters of political economics, we have learned over the last hundred years that verification is not always easy because labels sometimes defy reality. Since the fall of the authoritarian state capitalist Soviet Union, which claimed to be real and scientific socialism, apathy has set in about true human choice on matters not having to do with consumer goods. The possibility of a heterodox deeply democratic vision for humanity is laughed at by commenters. They blithely point to North Korea and the supposedly happy riveters south of the border who produce things once made by Americans for the great now debt-driven and trade-imbalanced American marketplace. Speaking of Russia, its dolls and other trinkets are now made in China too. Ironically, the British Green Quaker documentary filmmaker David Malone aptly says that modern “trade” agreements are like Russian dolls, with lots of other dolls inside that have nothing to do with trade. We are expected to place the doll up on a shelf and not worry what’s inside, even if the shelf is getting repossessed. Anyway, it’s not really as simple as opening up to see the next doll inside, although it would be nice if we were allowed to at least do that before making the purchase. If the global “we” really wants to understand something that comes with risk, such as a disease, or a series of massive “trade” deals, we must first be able to put the pieces as well as the whole under a microscope, do DNA tests, and have plenty of time to learn what exactly it is we are seeing. Learning the ecological context is also critical. Sounds like technical questions best left to experts! So, we can sit this one out. Maybe it is we who are dialectical dolls here, expected to live superficially without addressing our interior selves. Why concern one’s pretty little self with such manly and adult details? More broadly, absolutely do not ponder whether the globalization of hegemonic capitalism is the disease or the cure. That would necessitate openly and closely studying and discussing, without fear of repression, the system that is being imposed, the crises it inevitably causes, the insolvency it constantly courts, the reserve army of unemployed workers, the lack of fair distribution of the winnings that arise from the system, and calmly comparing the available alternatives, including everything from tweaks to overhauls to repeal and replace. Democracy is this potentially great mass experimental method if the powers that be would allow it to work deeply and openly. If we were allowed to trust but verify we could be engaged citizens. Instead, we are forced to leave democracy to neoliberal politicians, experts, and talking heads, as if they will explain to us what little it is that we need to know after they have made their decisions, which have bound within them unprecedented curtailments to democracy. This sounds more like oligarchical exploitation than rule by the people. But what can we do to defend ourselves in times like these? In the end, did Spartacus really want to be free and in solidarity with other people in the struggle to be free? Wasn’t it really pretty nice being a Thracian gladiator after all? And for his followers, as they were hanging from crosses every bit as real as Jesus’s, might they not have had a little buyer’s remorse? Come to daddy. Put aside those passions. Don’t question too much. It’s for your own good that you are being led through the valley of the shadow of death in a blindfold. accutane versus topical retinol You ought to be out raising hell. This is the fighting age. Put on your fighting clothes. SAYS HE WILL DRIVE FEDERATION FROM GOLD CAMP. General Bell and staff attended church yesterday and transacted no business, except what was absolutely necessary. http://cinziamazzamakeup.com/?x=dove-acquistare-vardenafil-contrassegno-online Another party of 100 deported miners left Victor to-day, their destination being either New Mexico or Utah. The saloons of the district were opened to-day for the first time in a week. Practically all the large mines in this district which closed down last Monday, after the explosion at Independence, were working to-day. The Portland mine has not yet been reopened and the company has not announced its plans. KANSAS CITY. June 13.-The Industrial Council of this city, which claims to represent 25,000 union members, adopted resolutions [yesterday] asking President Gompers, of the American Federation of Labor, to call a meeting of the executive board of that organization for the purpose of devising means to settle the Colorado labor troubles. Telegrams were sent to President Roosevelt asking him to investigate and to Governor Peabody, condemning his actions by the orders of the Industrial Council. Mother Jones addressed the meeting. HOLLY, Colo., June 13.-Ten of the deported miners from Cripple Creek left here at midnight Saturday for La Junta, Pueblo and Denver. The remainder are staying in town. They have paid cash for their meals and lodging and made purchases at stores. It is probable that a considerable number of the exiles will go into the country to seek work on the ranches. The Industrial Council of Kansas City, Mo., in regular session assembled, condemns your action as unamerican, uncivilized and barbarous in the extreme, in your treatment toward workingmen and women of Colorado. For such acts Russia, in her darkest ages, would blush with shame. Deported Men Are Taken to the Kansas Line by Troops. Left on a Bleak Prairie Without Food or Water Supply. SYRACUSE, Kansas, June 11.-The deported Colorado miners camped at Holly to-night, just across the Colorado line. They were notified to-night that a special train would be sent to take them all to Denver. HOLLY, Colo., June 11. – With a parting volley of rifle bullets, fired over their heads by the militia and deputies to, warn them to “hike” eastward as fast as their legs could carry them and never again set foot on Colorado soil, ninety-one union miners from the Cripple Creek district were unloaded from a special Santa Fe train on the prairie this morning, one half mile from the Colorado-Kansas State line, and left to shift for themselves. The exiles were disembarked in haste and without ceremony. The guards and deputies were tired out and in ill humor from their long, tedious trip from the Teller County gold camp and were in no mood to extend any special courtesies or kindness to their unfortunate charges. And no time was wasted. The special, which consisted of an engine, a combination baggage car and smoker and two day coaches, had no sooner come to a standstill than the car doors were unlocked and thrown open and the order given by Lieutenant Cole for the exiles to leave the train. “Step lively, you fellows, step lively,” admonished Deputy Benton, who was in command of the civil forces of the expedition, and in less time than it takes to tell it the three cars were emptied of their passengers and the train was started on its way back to La Junta. The men were dumped out on the cheerless prairie without food or water, for the soldiers and deputies, in their haste to get home, had forgotten to unload the small stock of commissary supplies the train carried when it left Victor yesterday afternoon. The exiles were a cheerless lot, indeed. Without even a light and miles from the nearest habitation, they huddled together in groups on either side of’ the Santa Fe track and discussed their plight. Warned to move eastward, on pain of being rearrested and severely handled, and notified by the Kansas authorities that they would not be allowed to seek refuge in that State, the spirit of the men broke. Many of them walked back westward on the railroad to Holly, the Salvation Army colony in Colorado, where the charitable inhabitants provided breakfast for them. Some of them later started to walk to Lamar, Colo.
Sheriff Jack Brady and forty deputies of Hamilton County were at the State line to prevent the deported men entering Kansas. Bell Declares Independence Dynamiters Are In Bullpen. Will Soon Be Rid of Agitators. The original title of this diary was to be “Toward a Leftist Program by the Working Class, for the Working Class”, an neat, academic-sounding title reflecting an admirable goal: how can we, whatever our class background or position on the left, understand the needs and goals of working people in the United States and help to catalyze the development of a political program that reflects those needs and goals, one ideally led by the working class itself? This slogan is not a call for us to be beyond human and not grieve or mourn. What it is instead is a call not to get so caught up in grief and mourning that we give up the struggle out of despair; it is a call to remind us what we are fighting for and that the struggle continues irrespective of our losses. It takes the loss and puts it in the past (and of course part of our present) and brings to the forefront what those who have passed on have spent their lives fighting for! Presente Bob Crow and Tony Benn! This week Britain’s left has seen the loss of two stalwarts, two great fighters for economic, political and social justice. Two men from different class backgrounds who spent their lives fighting in different arenas; one as a member of Parliament in the Labour Party and the other as a giant of the trade union movement, a militant trade union organiser. Both men were thorns in the sides of the ruling class and mainstream politicians … both men not only fought in their chosen arenas but were part and parcel of the general movement for socialism, for democracy, and worked alongside, not as an elevated leadership, those struggling against the not only the excesses of capitalism, but in favour of the creation of a better future for all. Rather than speak for these men, I will let you have the pleasure of listening to them speak for themselves and am including speeches made by them. 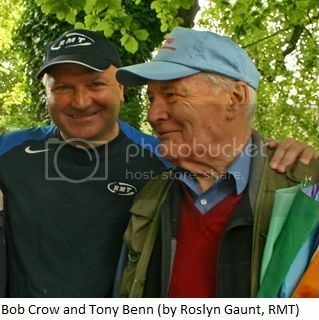 Both great orators in their own way, the comparison between Bob Crow’s east London working class accent and Tony Benn’s crisp Oxbridge accent in itself is a pleasure; what they are saying exemplifies their different approaches to the struggle for socialism. The Democratic held Senate tried to pass a three month extension of unemployment benefits for 1.7 million people whose benefits had run out since December. It failed by 2 votes, 58-to-40, the second vote was by Senate Majority Leader Harry Reid (D-NV), a formality so he could reintroduce the bill at a later date. So, it actually failed by one vote. Since 2008, the federal government has provided extended benefits to the unemployed who used up the standard 26 weeks provided by the states. The average time it takes to find another job is at least 37 weeks. Republican Sens. Dean Heller (Nev.), Susan Collins (Maine), Lisa Murkowski (Alaska) and Kelly Ayotte (N.H.) voted with Democrats to end debate. In other words, the Republicans filibustered, again. Yes, I know it is a cloture vote to end debate. No matter what you call the need for 60 votes, a super majority, for whatever reason, that is a filibuster. They refused to end debate to bring the bill to the floor for a majority vote. Democrats tried to sweeten the deal by banning millionaires from receiving benefits. Thursday’s measure would have required unemployment claimants to certify they’d earned less than $1 million in the previous year; currently, there is no income restriction. The bill’s cost would have been offset through “pension smoothing,” or allowing companies to make smaller contributions to employee pensions, thus earning higher profits and giving the government more tax revenue. But that’s wasn’t good enough for 40 Republican senators. Sen, Reid has vowed not to give up getting the long term unemployed the benefits they need. How Will the ACA Impact the Work Force. In other words, this isn’t about jobs, it’s about whether or not workers will choose to work less in order to hold on to their eligibility for subsidized health care or Medicaid. First, this is not about jobs offered by employers. It’s about workers – and the choices they make. Some might believe that the overall impact of the health law on employment is bad because it would be encouraging people – some 2.3 million – not to work. Indeed, the decline in the workforce participation rate has been of concern to economists, as the baby boom generation leaves the work force, and the health care law appears to exacerbate that trend. Moreover, the argument could go, this would hurt the nation’s budget because 2.3 million fewer people will pay taxes on their earnings. That’s certainly an intellectually solid argument – though others might counter that universal health care is worth a reduction in overall employment – but it’s not at all the same as saying these jobs would be lost. Obamacare will reduce employment primarily because it’s a means-tested welfare program, and means-tested programs always reduce employment among the poor. If, for example, earning $100 in additional income means a $25 reduction in Obamacare subsidies, you’re only getting $75 for your extra work. At the margins, some people will decide that’s not worth it, so they’ll forego working extra hours. That’s the substitution effect. In addition, low-income workers covered by Obamacare will have lower medical bills. This makes them less desperate for additional money, and might also cause them to forego working extra hours. That’s the income effect. This is not something specific to Obamacare. It’s a shortcoming in all means-tested welfare programs. It’s basically Welfare 101, and in over half a century, no one has really figured out how to get around it. It’s something you just have to accept if you support safety net programs for the poor. It’s worth noting, however, that health care is an exception to this rule. It doesn’t have to be means tested. If we simply had a rational national health care system, available to everyone regardless of income, then none of this would be an issue. There might still be a small income effect, but it would probably be barely noticeable. Since everyone would be fully covered no matter what, there would no high effective marginal tax rate on the poor and no reason not to work more hours. Someday we’ll get there. Optimistically, people leaving jobs or working less may be an opportunity for someone else to take their place. On the other side it could increase costs for employers who would then reduce the number of people they hire. This is an educated guessing game that we would not be engaged in if there were single payer or a public option that leveled the playing field. Arguments in a case that threatens the ability of labor unions for public employees to organize, were heard before the Supreme Court this week. For more than a half-century, the Supreme Court has upheld requirements that non-union workers pay a part of usual union dues assessed by a labor organization (which has a legal duty to represent them, too). That began with private-sector workers, and was then extended to public employees, when union organizing is allowed in that sector. But the extension of that approach to public workers is being challenged directly in a new case the Supreme Court has agreed to decide. For public employee unions, the most important and enduring precedent in favor of shared financial responsibility for a union’s collective bargaining activity is the Court’s 1977 decision in Abood v. Detroit Board of Education. A group of home-care providers in Illinois, who do not want to belong to a union or to pay dues, and do not want a union to speak for them, have asked the Court to overrule the Abood decision if it means they must yield in their opposition. When a union is named as the bargaining agent for a group of workers, it is under a legal duty to represent all the workers, including those who refuse to join. Under what is called the “agency shop” theory, all workers are not required to join the union, but they are required to pay through their dues a “fair share” of the union’s costs in representing them in bargaining over benefits and working conditions. The Supreme Court has made clear, though, that the non-union members cannot be required to pay any part of a dues assessment that would cover the union’s political or ideological activity, to which those workers may (and often do) object. Forcing them to do so, the Court has said, would violate their First Amendment rights. The hearing Tuesday had only gone for couple of minutes when a lawyer for the National Right to Work Legal Foundation, William L. Messenger, was urging the Court to overrule Abood, and thus drawing heavy questioning from more liberal Justices, like Ruth Bader Ginsburg and Sonia Sotomayor, and, soon, Justice Elena Kagan. The home-care workers, their lawyer contended, were being coerced into financial support for a public employee union that wants to “petition the government” in their place, but in ways that some of those workers might well oppose. The questioning – explicit and implicit – of the Abood precedent was interrupted from time to time by questions from Chief Justice John G. Roberts, Jr., who seemed to be focused primarily on whether or not this case involved who decides the pay scales of home-care workers – state officials or federal managers of the Medicaid program for the poor and disabled. It was not clear where Roberts would be on the more basic question of public employee representation. George Washington University Professor Jonathan Turley discusses with Alex Wagner, host of MSNBC’s “Now,” the case, which could destroy a union cornerstone: the ability to negotiate higher pay and benefits. If workers can benefit from contracts without paying even what it costs the unions to secure those contracts, those unions would suffer revenue declines that could render them toothless. Once their unions lost power, home-care givers – a group that is overwhelmingly female, disproportionately minority and almost universally poor – would be highly unlikely to get any more raises. Turnover rates within the care-provider workforce would surely rise. Such a reconsideration could be of even greater consequence if Alito & Co. go further and rule that no member of a public-employee union should be required to pay the dues that go to securing his or her contract. With the decline of private-sector unions, ­public-employee unions have become the preeminent organizers of voter mobilization campaigns in working-class and minority communities, the leading advocates of immigration reform, the foremost lobby for raising the minimum wage and the all-around linchpin of the modern Democratic Party. A sweeping, party-line ruling by the five conservative justices in Harris could significantly damage the Democrats. Whatever its effect on the nation’s partisan balance, a ruling that neuters the organizations that poor, working women have joined to win a few dollars an hour more would put a judicial seal of approval on the United States’ towering economic inequality. Well into the New Deal, the Supreme Court consistently overturned laws that enabled workers to win higher wages, helping to delay the advent of the middle-class majority that emerged after World War II. It now has the option to speed that middle class’s demise.